I picked up the larger 49mm ZenWatch 2 today and aside from finding it's remarkably more responsive than my Urbane, it seems big on my thin wrists. It basically takes up my entire wrist. I love the big display but it might border on looking silly. I am thinking of waiting for the 45mm model to come to my area in a week or so but I'm concerned about the thinner band. It seems like the 22mm band is about as thin as I should go. 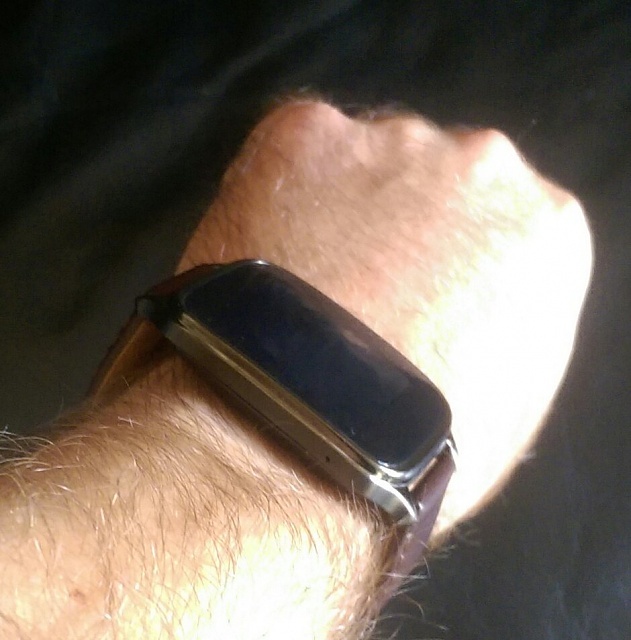 18mm band may just be too thin. 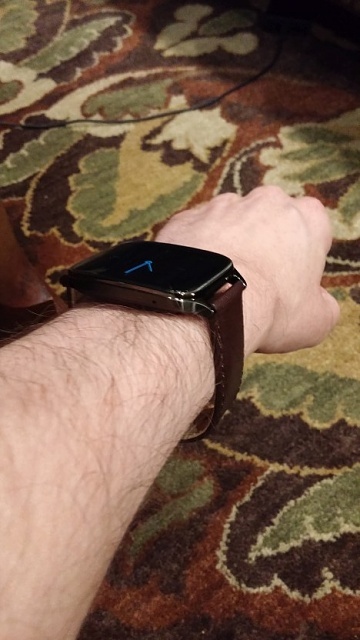 If I got the 45mm model, I would definitely want to swap the band for the brown leather... but it seems like those bands are hard to find. Ok - this is all subjective but does any one have the smaller one? Your thoughts? I like the larger size, but I wish that the band was just a bit larger. I have the band in the last home and it is snug, so I am at the other end of the spectrum than you are. The big one doesn't look too big imo. Then again I'm used to wearing a gshock watch. As far as I know, you can replace the band with any standard band of the same size (22mm?). You might be able to find a longer band... I mean, they must be out there. 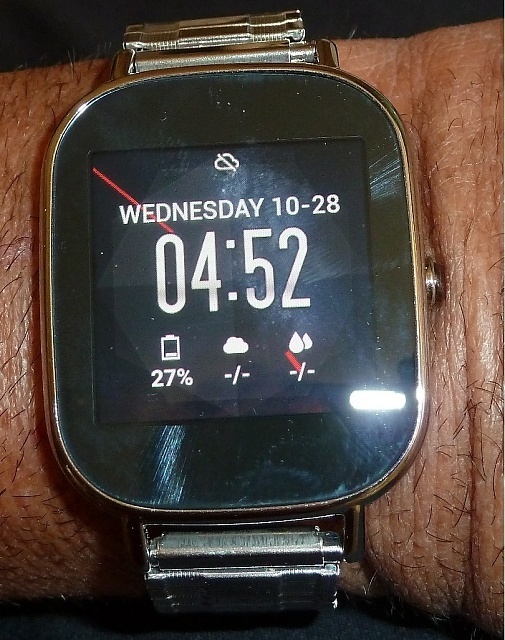 I did replace the band, I put a metal mesh band that I got to use with the Samsung Gear 2 Neo. 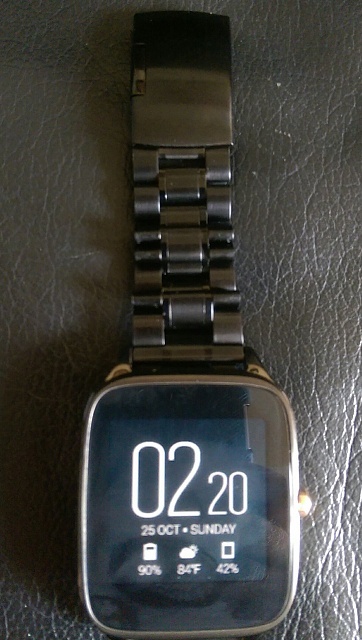 I must say that 3rd party bands look a lot better on the ZenWatch 2 than on the Samsung Gear 2 Neo. I totally agree with you PaulQ. I purchased the larger one on Saturday at my local Best Buy and Sunday I took it back for the smaller one. It was just too large for me. It looked like i had a mini TV on my wrist ( and that's because i am a big watch kind of guy). The only down side to the switch was the band size. The 18mm band does look a bit feminine, and the wrist band it came with was definitely feminine. I purchased a black leather wrist band and it looks good. The actual watch size is perfect to me. I'm just gonna have to get use to a smaller band but overall i like it. Well... I went to Best Buy today and returned the watch. Just too big. I agree, looked like a TV strapped to my wrist. They didn't have the smaller one. I'll wait and see when my local Best Buy gets the smaller one in stock. Check it out then. Or - I may just opt for the Gear S2. I tried that on and it is absolutely the right size. Unfortunately, double the price and no Android Wear. I got the 45 mm and love it! perfect for my female wrist, although it does sit a bit high. will just take a bit of getting used to. Tried on both at my local Best Buy - the 49mm felt similar to my 1st Gen G-Watch, very bulky. I have skinnier wrists so the 45mm, while small, looked much better. I unfortunately haven't bought it yet. Was just trying it on in the store. I'm unable to comment on the 45 vs the 49, as I've only tried the 49 at this time. Today I received a 49 I had ordered (the same gun metal version with brown band as shown in OP). I have to say I think it looks nicer (both the watch and the strap) in person then it does in pictures. I have a metal band arriving tomorrow, so I'll let you known how the watch looks once the band has been switched to the one I linked above. I'm suspicious that the overall look of the watch (including how big it looks and how it relates to the arm) can vary depending on what size, style, color, thickness, etc band is paired with it. Maybe I'll take before and after pictures with the watch on my arm to have a basis for comparison as well as to share with everyone (if people are interested in me doing so). Maybe I'll take before and after pictures with the watch on my arm to have a basis for comparison as well as to share with everyone (if people are interested in me doing so). I would love to see some pictures with the new band. It doesn't look it in the pictures, but the new band color matches very closely with the gunmetal color of the ZenWatch 2 I have. I took out all the removable links, but the band is still a touch big for my wrist. I think if I had the Chargeback device that can be attached to the bigger unit backs I think the band would fit better on my arm/wrist. Thanks for posting those! I like the black metal band. Definitely makes it look even nicer. I first bought the first gen original Zenwatch which was only available in the large size and while it looked nice it was way too big for my small wrist. I thought it looked silly and didn't really feel very comfortable to wear. 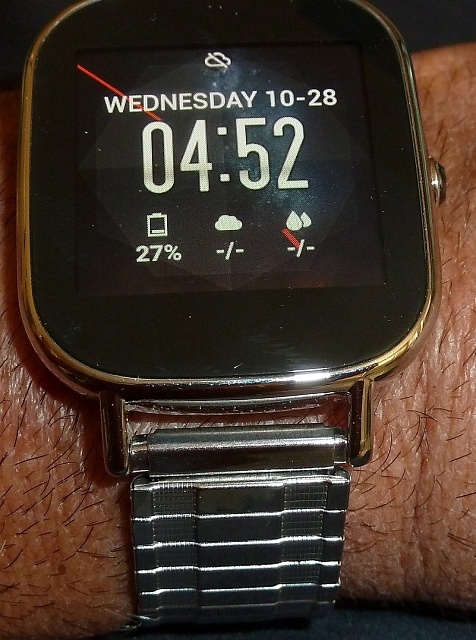 Then I bought the ZW2 smaller size silver with khaki band and it is a MUCH better fit. Still a little large but its actually only a little larger than my old Casio digital watch and surprisingly slightly thinner. 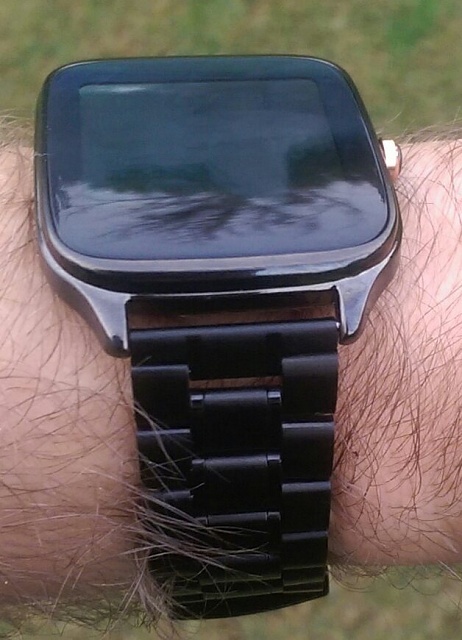 However I am very much used to watches with metal expansion bands and I picked up one at Walmart for $8 and it fit perfectly and looks very nice. So its definitely a keeper and so far it seems to be working quite nicely. I] Still a little large but its actually only a little larger than my old Casio digital watch and surprisingly slightly thinner. 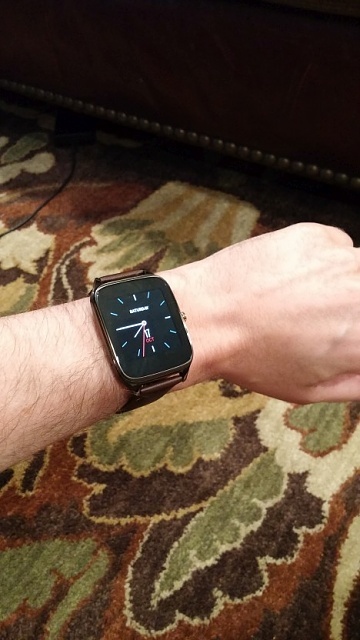 However I am very much used to watches with metal expansion bands and I picked up one at Walmart for $8 and it fit perfectly and looks very nice. So its definitely a keeper and so far it seems to be working quite nicely. 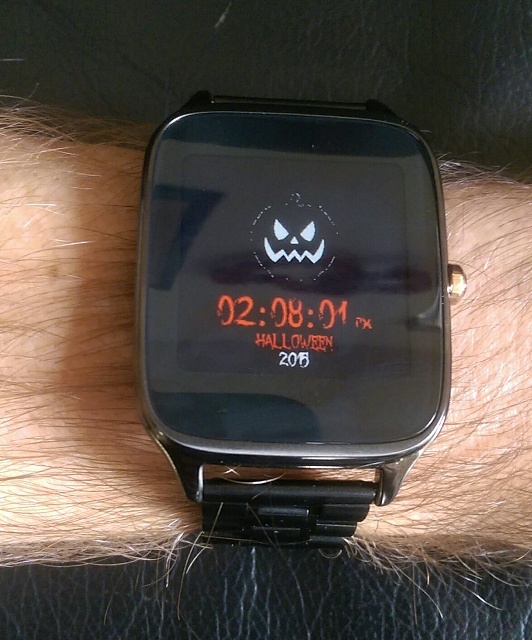 Gerry - If possible, could you post a picture of the watch with the band? Thanks!! Here you go! That band literally cost only $8 at Walmart, and once I got it adjusted it and the watch are now quite comfortable. It matches the silver color of the watch and looks very nice! 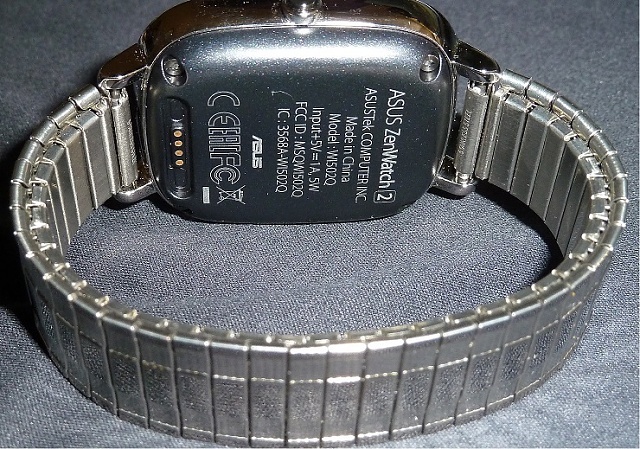 By the way, it is quite tricky to adjust a metal expansion band but it is possible - I had to take out one link. If you do get an expansion band and need to adjust it just search on YouTube as there are several videos that show how to do it. Any 18mm band should work with the smaller Zenwatch 2 right? I just took a measurement and it looks like the band I got and the spacing at the ZW2's brackets is 19 mm (which may really be 18 mm). So yes, any watch band that is 18 mm should fit the ZW2 as it uses the standard springy pins to hold the band just like any other watch. Most metal expansion bands have a spring loaded tube that the pin goes into which allow it to fit a range of sizes. The band I got measures 19 mm at the band itself but it can fit a watch with connections from 18 mm to 22 mm. Just got the last 45 MM in town it seems at Best Buy. I tried the bigger one and its WAY too huge for my wrist. The 45 was just the right size. Plus I prefer the band that came with the 45 vs. the giant clamping mess that the 49mm has. I went with the larger size because of the speaker support. 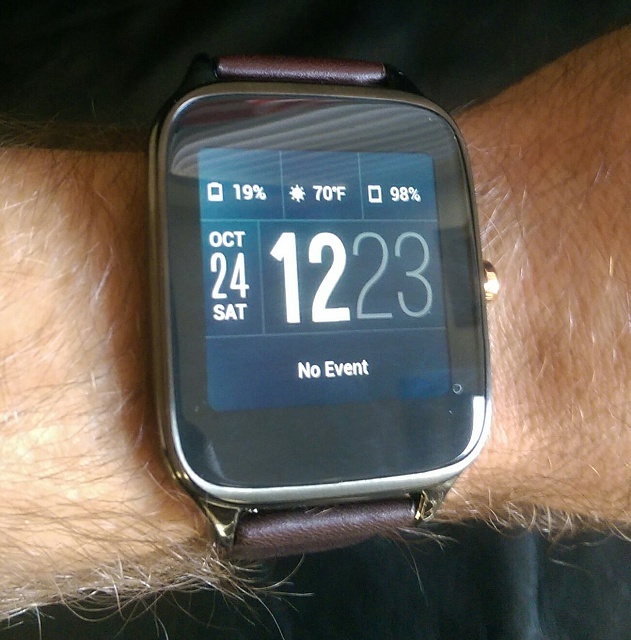 With the latest Android Wear update you can make and receive calls. I'm not 100% sure but I think none of the Zen Watch models have a speaker, so even if the updated Android Wear app supports making calls I don't think the ZWs will be able to do that. The larger one has a speaker, and Google has confirmed it can be used for Bluetooth calls. You're wrong. The bigger model absolutely has a speaker. It was confirmed by multiple sources a long time ago and Google even mentioned the support in its blog post. Those of us with the bigger model will be able to make calls when we receive the new update which was announced today. Why are certain apps not working on wifi? What is the number 1 next to the messaging app? Get rid of little white lock in the corner of my galaxy S5 home screen...?